Apparently my last few posts are loaded with japanese cuisines, so this time around I'm going to feature some exotic western food from the San Francisco SteakHouse. San Francisco offers a wide array of appetizers, fine steaks, seafood and delectable desserts. Although appear to be pricey, the portion of the mains served on that nite were quite large, a great place for big eaters and carnivours. Every patron gets complimentary bun and butter too! 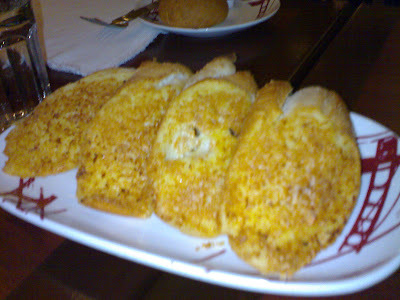 We had these big slices of garlic bread (RM6) as starter. This is the most reasonably priced food in San Francisco. Even a bottle of 1.5l mineral water costs RM8! The thick bread slices are loaded with butter and aromatic garlic pieces. Greasy but really delicious. 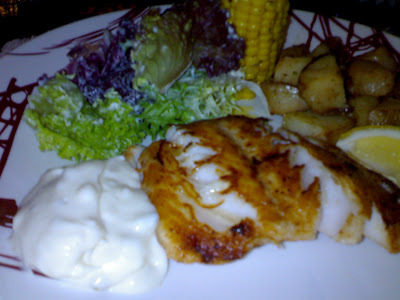 I had the Canadian Grilled Cod Fish (RM38.90), served with sauteed potatoes, corn, and salad with mayo dressing. Wow this is really good, I just luv cod fish! The meat was fresh, juicy and tender, grilled to the perfection. 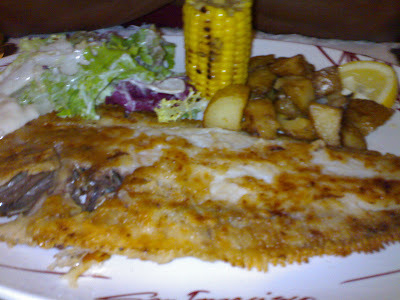 I forgot the exact name of this main, I think it is something like the Norwegian Sole (RM 37.90)-- a big slice of fish fillet served with the same side dishes. 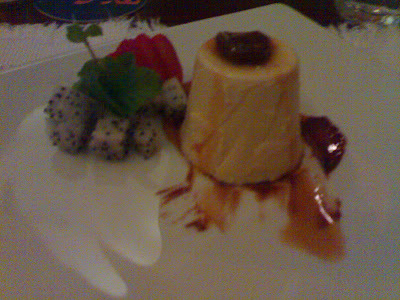 The lovely (in terms of presentation) Panna Cotta (RM9.90)--a sweet vanilla flan drizzled with super sweet caramel. Err...which I thought that it is too sweet for me. Overall, the food was good, nice ambience and attentive service. But I still prefer japanese food ^_^ Sushi n' sashimi rocks! Hi..it seems like you know lots of places to eat. Mind to intro any nice and romantic places for couple for celebration purpose?